Despite equities seeing significant gains into the opex close, the VIX still managed to hold above the key 20 threshold, settling -5.9% @ 21.07. Regardless of any equity chop/weakness next Tue/Wed, with the ECB set to launch major QE, the VIX looks set to fall into end month. *across the week, the VIX gained a very significant 20.1%. 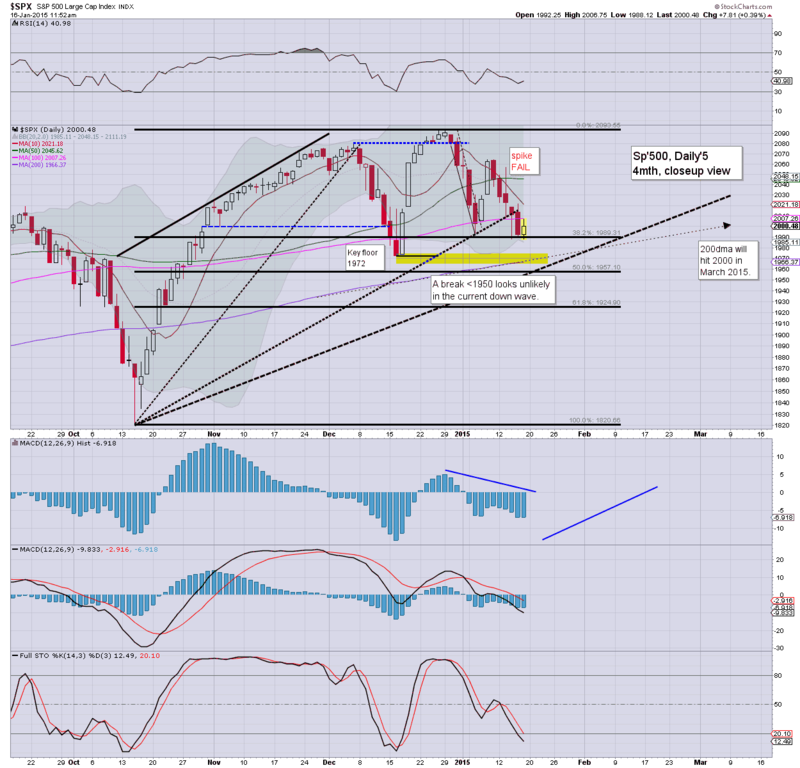 The weekly candle though is a little spiky, and is likely indicative that a cycle high might be in. 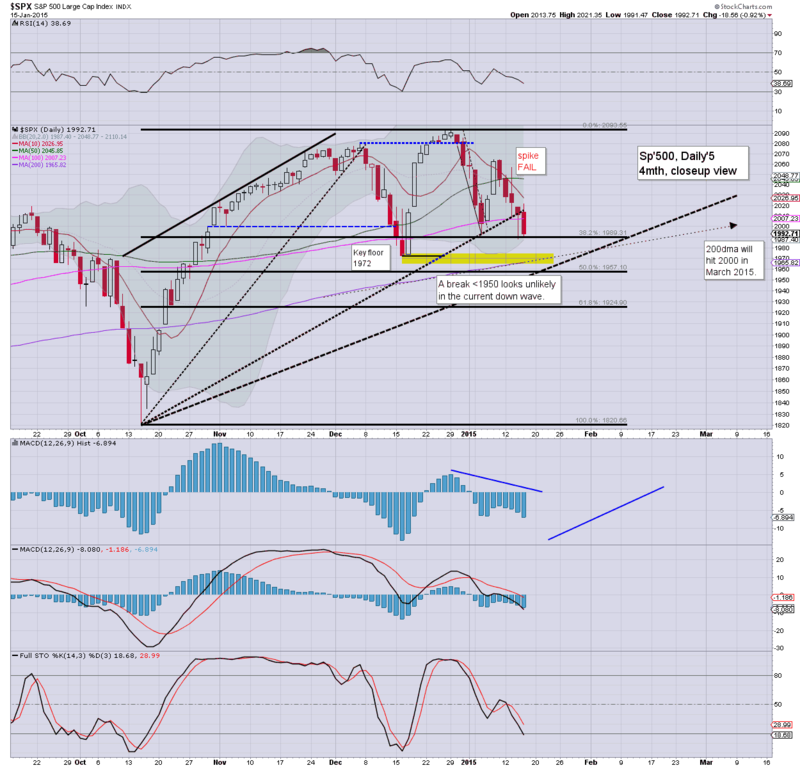 Suffice to say.. a somewhat rare (at least compared to 2012-14) weekly close in the 20s. Even if the market falls next Tue/Wed (for whatever reason)... VIX looks set to broadly fall into end month/early February. US equities closed significantly higher, sp +26pts @ 2019. The two leaders - Trans/R2K, settled higher by 1.2% and 1.9% respectively. 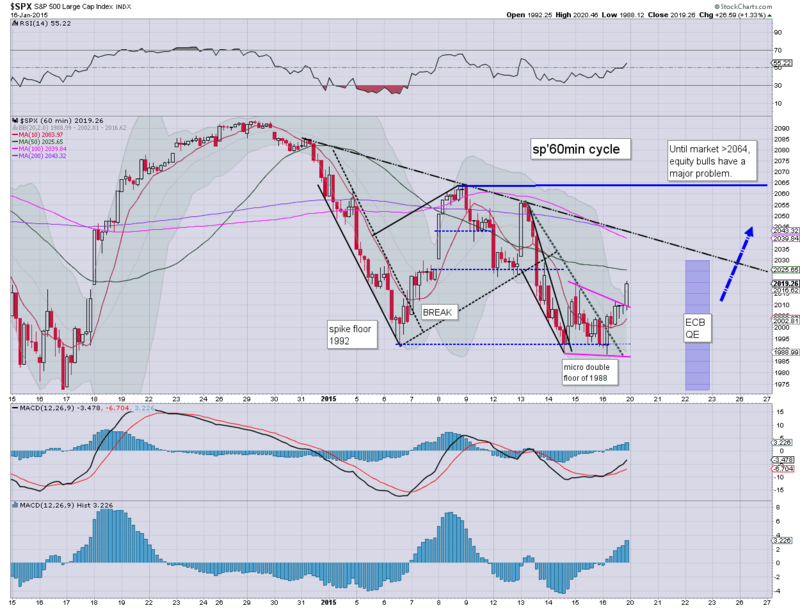 With the closing hour strength, the viability of a hit of the 200dma has greatly decreased. In any case... broader upside... once the ECB announce QE. ... and another week in market land comes to a close. Congrats to all those who didn't get blown up by the FX changes! The closing hour was a major disappointment, and clearly, a fair few bears were either short-stopped out, or simply closed out for the long weekend. The chance of renewed downside to sp'1965... is much reduced. 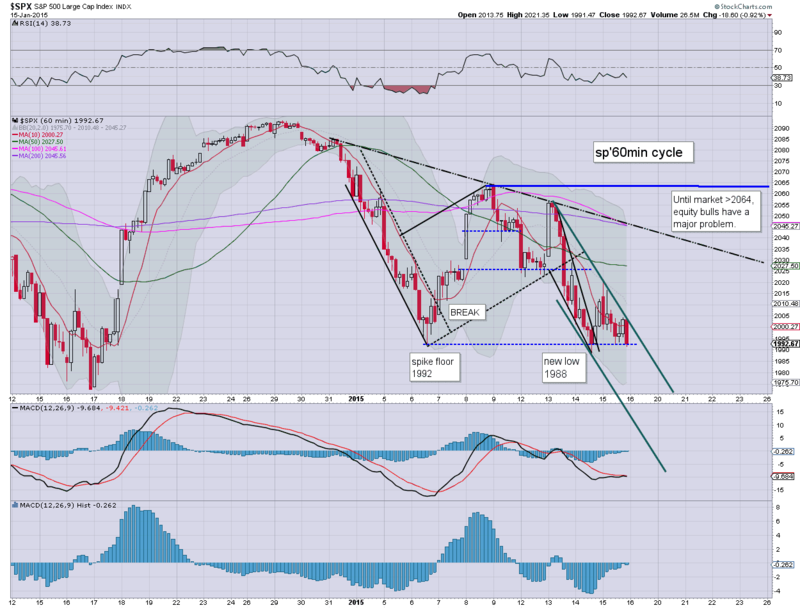 The smaller 60/15min cycles are offering a rollover into the close, not least ahead of a 3 day weekend. Regardless of the exact close, equity bears are set for the third consecutive net weekly decline. Further weakness seems due next Tue/Wed... before the ECB print machine is spun up. *I probably should refrain from adding colourful arrows on my charts.. but hey.. its my best guess. The last hour of what has been a pretty exciting week, not least with the SNB causing all sorts of havoc. 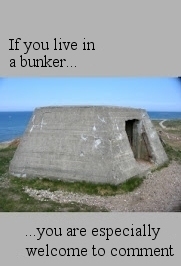 Seriously though... 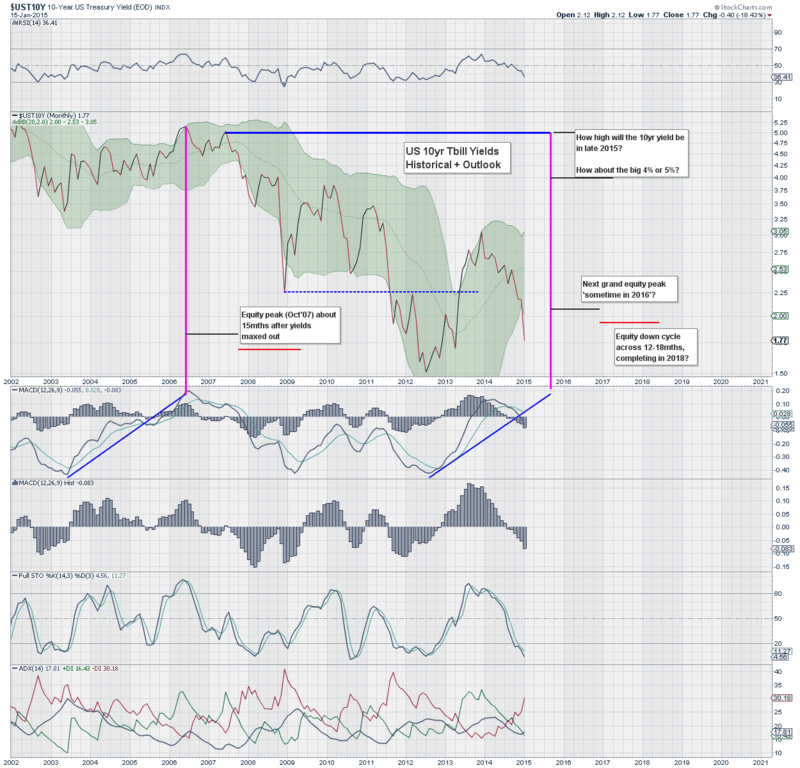 I look at the Swiss move as a pre-cursor to all sorts of 'system' trouble across the next few years. 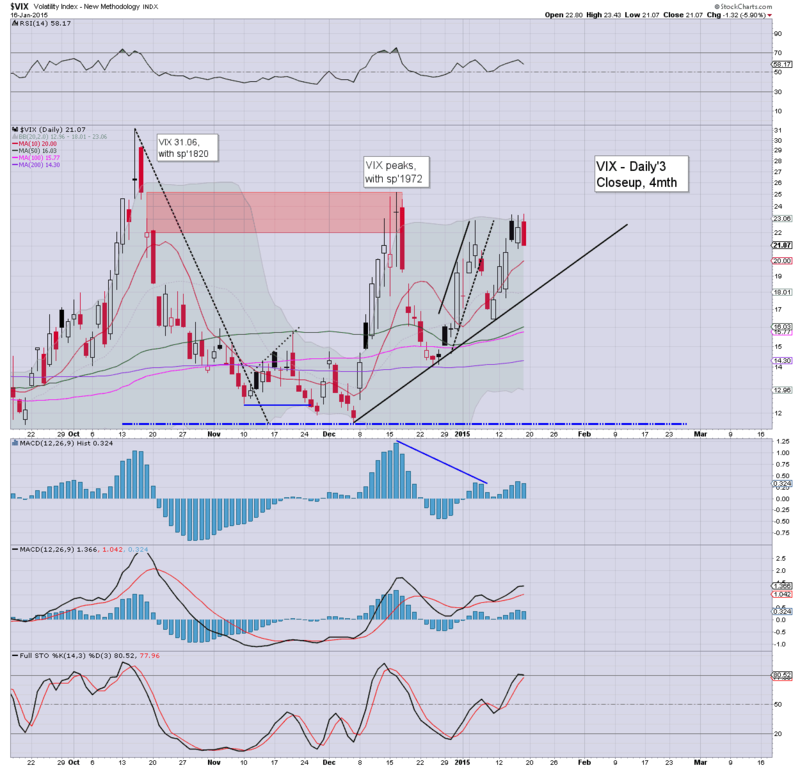 Market wants to sell lower into the close... sp'2008 , VIX set to close higher. regardless though... a hit of the 200dma of sp'1965 still looks highly probable.. before this nonsense starts a new multi-week up wave. The ONLY issue of importance now.... how strong is the next wave. A lower high (<2093)... or 2100s? Right now... considering the QE.. a new high in Feb/March still looks due. 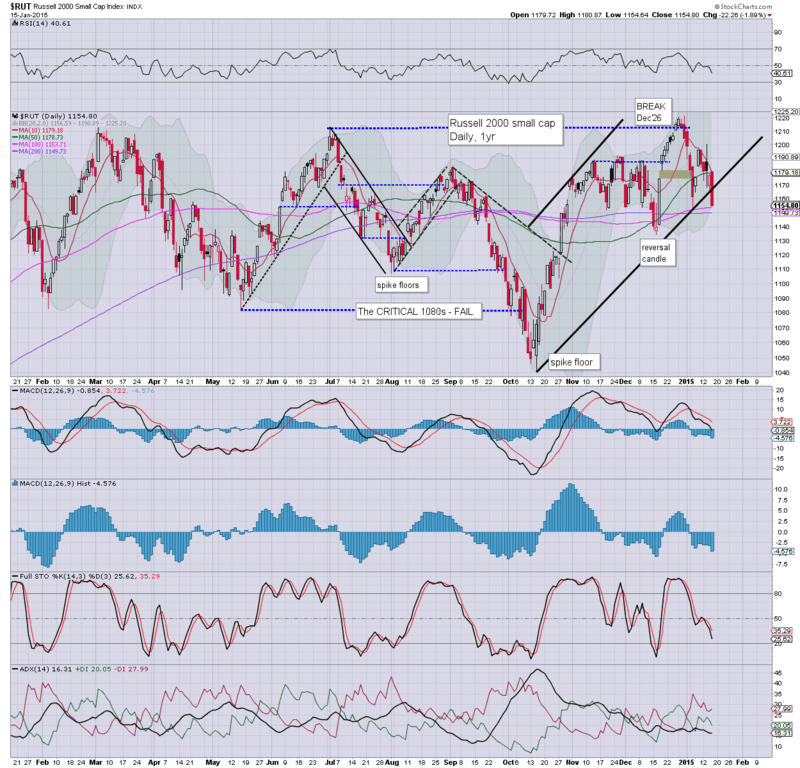 US equities remain moderately higher, but all things considered.. it is a weak up wave... and renewed weakness looks due.. for a test of the 200dma @ sp'1965. 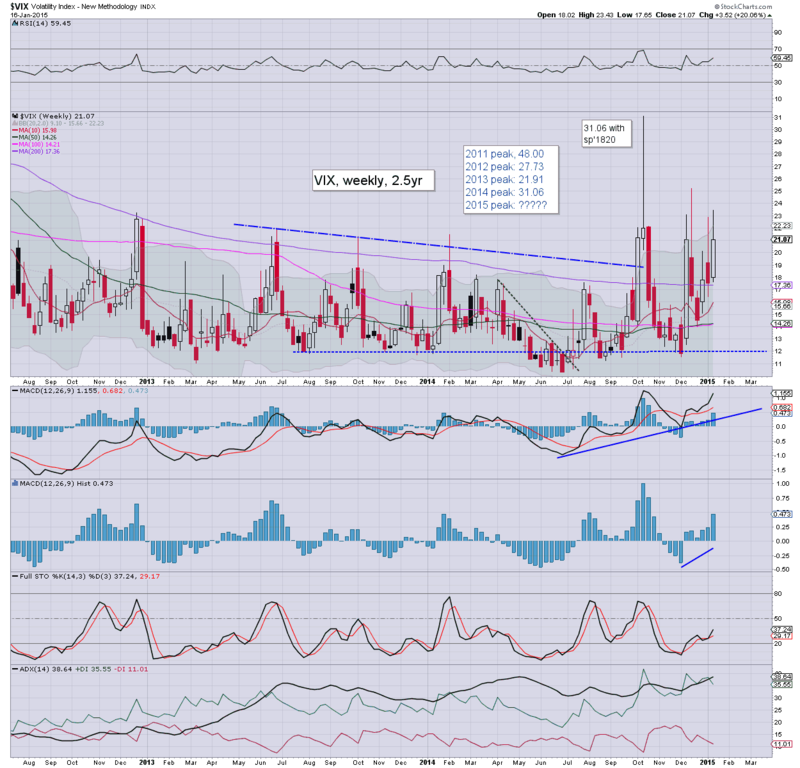 VIX is reflecting a market that is still concerned, holding the 22s. Gold continues to build gains, +$19. *Two issues to keep in mind, its opex... so expect more chop this afternoon... and we have a 3 day weekend... so.. might see increased selling into the weekend as some of the rats get twitchy. Other than that... little to add. So.. its a bit choppy, but then its opex. Best guess remains.. renewed downside to the 200dma of sp'1965... I think many would be quite surprised if we don't break to that. Clearly, that looks unlikely today.. and instead the target time frame will be Tue/Wed... just ahead of the ECB spooling up the printers. *eyes on the FX brokers... FXCM was lower by around 90% in the pre-market.. but is currently halted. Notable strength, energy stocks, Oil/gas drillers, RIG +2%, SDRL +4%. Good morning. 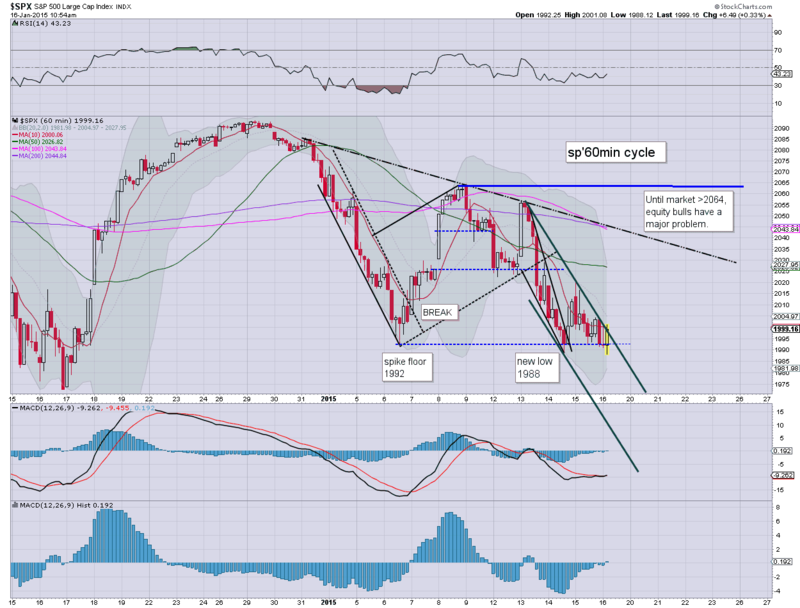 Futures are moderately lower, sp -8pts, we're set to open at a new cycle low of 1984. Metals continue to climb, Gold +$4. Oil is again trying to bounce, +1.6%. Overnight weakness has largely held, and we're set to continue lower today. 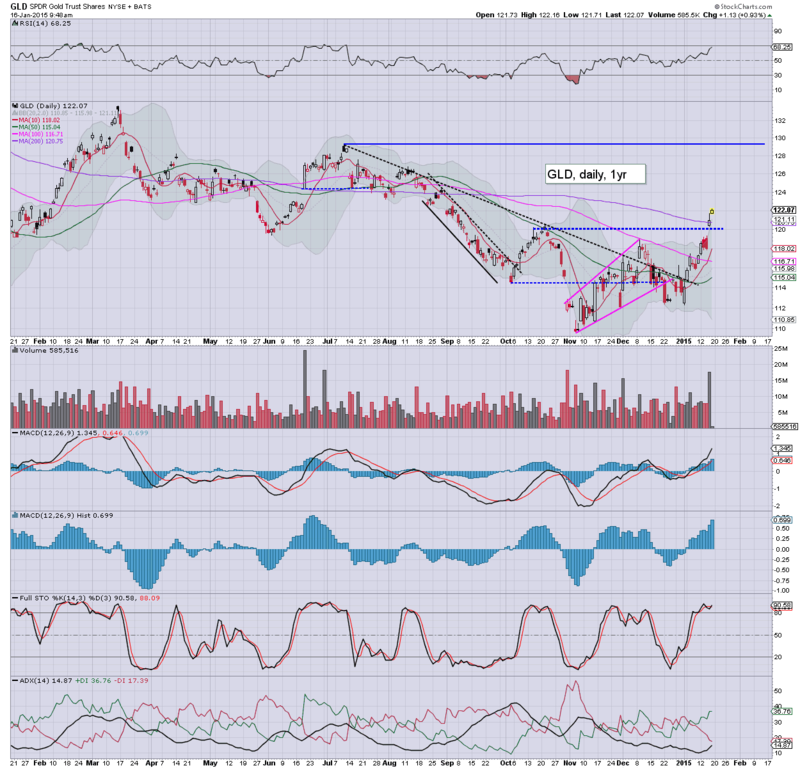 Primary target remains a hit of the 200dma... of sp'1965... that might equate to VIX 25/27. It would seem the Swiss National Bank (SNB) are more than confident that the ECB are going to announce a major T-bond buying program next Thursday. With the SNB deciding it is pointless to fight Draghi, world markets saw some wild price action in just about all asset classes. *its been a long day... so I'll keep this relatively brief. 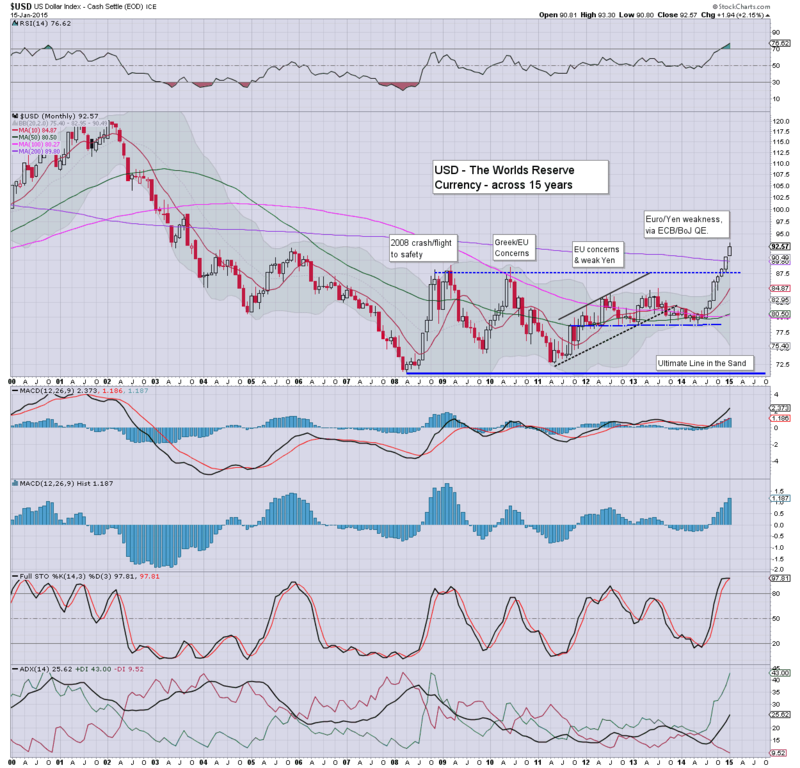 USD continues its broad climb. With the ECB set to announce T-bond buying next Thursday, there is little reason why Euro/$ parity won't occur. Re: the 10yr. chart. US bond yields continue to collapse. However, underlying MACD (grey bar histogram) is on the low side, and I expect a turn sometime soon. 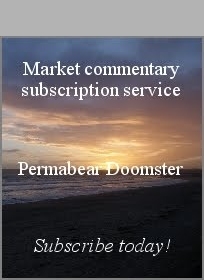 Friday will be busy... CPI, Indust' prod', and consumer sent'. It is opex, so expect some chop, especially in the latter part of the day. Since the US market is closed next Monday, there will no doubt be some pre-holiday trading issues. US equities saw a fifth consecutive day of weakness, sp -18pts (-0.9%) @ 1992. The two leaders - Trans/R2K, settled lower by -0.4% and -1.9% respectively. Near term outlook is for continued weakness, most likely to at least briefly test the 200dma of sp'1965. Suffice to say... a fifth day of declines. The only solace for the bulls is that the market didn't break under the Wednesday low of sp'1988. Yet, that does seem likely tomorrow.. or next Tuesday. With the ECB set to formally announce t-bond buying next Thursday, the equity window for the bears has another 2 or 3 days left in it.